Generose Nziguheba is a Soil Ecologist. Generose, a Belgian, is based in IITA-Kenya, Nairobi, Kenya. 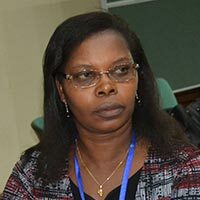 She obtained her PhD in Applied Biological Sciences from the Katholieke Universiteit Leuven, Belgium in 2001, and BSc and MSc in Agronomic Sciences at the University of Burundi in 1993. Before she took up this new appointment, she was an Associate Research Scientist at the Agriculture and Food Security Center, Earth Institute at Columbia University, New York, since May 2008. She was an Adjunct Soil Scientist at CIAT (November 2008–2012); Adjunct Research Scientist at Earth Institute, Columbia University (January–April 2008); a Postdoctoral Fellow-Soil Fertility Specialist at IITA, Ibadan, Nigeria, and Postdoctoral Research Fellow at Katholieke Universiteit Leuven, Belgium (January 2003–March 2005). She also served as a Postdoctoral Research Fellow at the University of Stellenbosch in South Africa (October 2001–October 2002), a Research Assistant at the Tropical Soil Biology and Fertility (TSBF) in Nairobi (May–October 1998), Postgraduate Research Fellow at the International Centre for Research in Agroforestry (ICRAF), Nairobi, Kenya, (May 1995–April 1998), and an Assistant Professor at the Department of Plant Production, Faculty of Agronomic Sciences, University of Burundi (October 1994–April 1995).